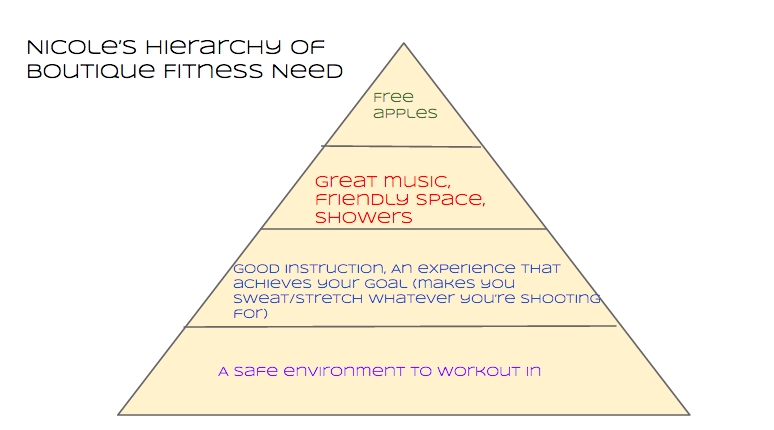 Does fitness have to be fancy? Since joining ClassPass last month I’ve had fun studio-hopping. I’ve spent some quality time with old favorites (Flywheel, Flybarre and Exhale). And I’ve tried some boutique fitness options that were not on my radar (Cyc, Nalini Method, Pure Barre and Moving Strength). Throughout the ClassPass experience, a few of the studios I went to provided a great execution of the direct service: giving me an awesome workout, but didn’t have the frills I’ve come to expect. And I felt disappointed, even though I was sore the next day. At the same price point (Nalini is actually more expensive than Physique for a drop in class) should we expect the amenities? Nalini (for example) was an incredible workout, but the facilities didn’t compare to Exhale or Physique. At the same price point, for me, Nalini would have to (somehow) offer a better workout than those other studios. Yoga studios started this by offering tea and cookies and a pillowed lounge to hang in post- and pre-class. But in that case, it felt like a continuation of the relaxation experience, not an amenity for amenity’s sake. When you fork over the $34, what are you personally hoping to get in exchange: the well-manicured environment, or simply the burning thighs? Sometimes the amenities actually do impact your experience: if you need to be able to shower after the class to go straight to work, access to showers and a towel are make or break. Moving Strength West has no waiting area, so if you’re early for your class there is no place to non-awkwardly be. Is that important to you? What needs are you fulfilling when you workout? To feel pampered or to get in the best shape possible? Or do you need both in concert? It was more important to me than I realized. That said, my favorite workout is still relatively free: running outside. What do you think? Are we owed free hair ties and packs of gum? When you pay $34 a class, do you view free water bottles as part of the package? I agree! I went to Barry’s tonight and the one here doesn’t have towels or showers!! For being such a high-end studio, I come to expect these things. I also (embarrassingly) plan my hairdo schedule around which studios I’m going to. For example, I didn’t straighten my hair on Monday because I knew I could use the steam room at Exhale on Tuesday. I love amenities!! Also re: hairdo: ME TOO. I’ll do a barre class before work because I won’t need to shower (overshare?) but running requires a redo on the hair. Hahaha YES!! Not an over share at all because I do the same thing!!! Barre Pilates yoga don’t require a shower/hair wash but the intense classes like spin bootcamp and I definitely have to wash my hair. So funny! The Barry’s is in LA–Sherman Oaks. We have 3 in LA and at least 2/3 don’t have showers! that is crazy. i believe in NYC they all do.